EDWARD HEELIS. We have not found a baptism for Edward Heelis. We know from his marriage licence that he was born around 1698. Gillian Waters, who has done much research on our Skipton ancestors, believed that Edward Heelis of Skibeden was the second son of William Heelis, farmer of Skibeden, who married Ann Slater in 1694. Their eldest son William was born in 1695, followed by a daughter Alice, who died in infancy. This is confirmed by William Heelis’s will, in which his son Edward is the principal beneficiary after his wife. Edward’s birth would fit neatly into this 4-year gap. He called his oldest son William. Edward became a yeoman farmer like his father. LEAH CATTERSON was the daughter of Stephen Catterson and his wife Grace Haworth. Her father was one of the leading citizens of Skipton. He was an attorney and a considerable landholder. He was the tenant of the Red Lion Inn on Skipton High Street, which was also a substantial farmhouse. 1697 Aug 24 Leah daughtr of Mr Stephen Catterson of Skipton. At this time, the title ‘Mr’ was only given to the gentry. She was the eldest of eleven children. Five of them died in infancy and one in his early twenties. Edward was 21 and Leah 22 at the time of their marriage. Twenty-one is rather younger than usual for a groom. Their father William Heelis did not die until 1726. 1719 Dec 16 Edward Heelis of Skibeden of ye parish of Skipton Yeoman and Leah Catterson of town of Skipton Spinster were married by Licence. Both the partners were from Skipton, but the township of Skibeden lies partly in Kildwick parish. The village of Kildwick is 4 miles south of Skipton. The marriage licence gives the intended place of the wedding as either Skipton or Kildwick. John Heelis, Tallow Chandler, who may be Edward’s brother, also married a Catterson. The young couple did not move to Skibeden immediately. They had ten children. Their address for the first two baptisms is Skipton, meaning that they lived in the town, but Edward is still described as a farmer. Edward’s father made his will in 1723. It is likely that he was in failing health.As the oldest surviving son, Edward and Leah and their young family moved to take over Skibeden Farm. Nine more children were born there. William Heelis yeoman died in 1726. Edward was the principal beneficiary of his will. He left a property in Eastby to Edward’s mother, and legacies from it after her death to Edward’s brother and sister. Edward then inherited it for the duration of the lease, as well as Skibeden Farm. He was to give his mother a cow from the farm every year. In the final baptism the mother’s name has been transcribed as Sarah. The original is hard to read, but it must be Leah, who did not die until 1780. It is a measure of the prosperity of this family that none of their eleven children died in infancy. The first to die was Margaret, who was buried on 14 Nov 1753, aged 17. In 1733 Edward Heelis yeoman also gained an interest in property in Lamberts Hill from his father-in-law. He and his brother-in-law, Francys Catterson gentleman, were joint lessees. In 1741 ‘Edward Halas’, of Skibeden voted for Fox in the parliamentary election and is recorded as an ‘Outliving Freeholder’. George Fox was the Tory MP for Skipton. In Jan 1742 Edward leased part of the Lamberts Hill property to John Heelis, Tallow Chandler. In Dec of that year John Heelis returned the tenements to him. This was probably his brother John. The same year Edward Heelis received the other half of the tenement in Skipton from Mary Paley, his sister-in-law. There was a sitting tenant. A year later he leased it, along with several other messuages, to Samuel Whaley of St Ives, Bingley. This must have been a short-term lease, because these tenements were among those Edward transferred in 1757 to his son Thomas Heelis of Skipton Castle. His son-in-law Samuel Jennings, mason, had leased “a barn, croft and garden and buildings” in Newmarket Street in 1751. He died in 1754. In 1757, his daughter Leah Jennings was one of the tenants. The distinguished lawyer Sylvestet Petyt set up a number of charitable trusts. They benefited the people of Skipton generally, but particularly members of the extended Petyt family. Edward Heelis was a great-nephew of his and Leah was the granddaughter of his sister Isabell. Edward was enabled by this trust to have all his sons apprenticed. Unlike our ancestor Anthony Petyt, he did not apprentice his daughters. 1736 Stephen Catterson with William son of Edward Heelis to learn Husbandry. Stephen Catterson was Leah’s father. 1738 John Heelis, Tallow Chandler, with John son of Edward Heelis. 1741 Robert Lepton, Scrivener, with Thomas son of Edward Heelis. 1744 Edmund Gundry, Butcher and Farmer, with Stephen the son of Edward Heelis. 1750 William Maude, Ironmonger, with Silvester the son of Edward Heelis. In 1744 John Heelis, tallow chandler, transferred a malt kiln and lands in Skipton Ings and Waller Close to Edward Heelis yeoman of Skibeden. In 1749, following the Civil War, John Heelis innholder, whilst a prisoner in the Castle at York, transferred lands at Lambert Hills which had figured previously in Edward’s transactions. Edward Heelis, Farmer of Skibeden, was buried at Holy Trinity on 22 Feb 1772. He was in his mid-seventies. He was buried in the same grave as his daughter Margaret, who had died at the age of 17. Edward left his lands to be divided equally between his sons, William Heelis, Butcher, of Bolton in the Moors, Lancashire, and John Heelis of Skipton Castle, gentleman. Leah died in 1780, aged 83. She and their youngest daughter Elizabeth, who had died aged 36, were also buried in this grave. 1780 Aug 23 Leah Widow of the late Edwd Heelis of Skibeden. 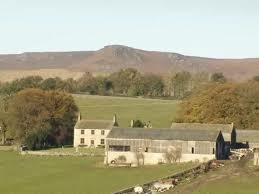 The eldest son William moved to Bolton in the Moors where he was a butcher. In 1778 “William and his younger brother John inherited their father’s estates as ‘heirs in common’. Anne married a labourer. This suggests that “the Heelis family was only just in the yeoman strata of local Skipton society. However, Thomas [Whitham] may have been the son of another smallholder, working as a labourer to gain a living whilst waiting to take up his place in his own farm.” Anthony Petyt’s father John was in that position. He is said to be a labourer at the baptism of his first child, but thereafter a farmer. Sylvester set up a hardware business. He may also have farmed. In 1772 “Sylvester Heelis, yeoman, was elected Parish Clerk for Skipton.” Sylvester’s daughter Margaret and her husband emigrated to New Zealand. Mary married Anthony Petyt Farmer in 1759. A later descendant of the Heelis family was Willie Heelis, solicitor of Appleby, who married Beatrix Potter. He lived with her at Hill Top Farm in the Lake District.